The European Union and several of its member nations are moving forward rapidly with the concept of lowering the carbon footprint of houses. Concerns over climate change have driven this movement but many groups are now recognizing the practical implications–carbon neutral houses generally offer significantly lower operating costs. In Great Britain gas emissions have to be reduced by 80% by 2050 and all buildings have to be carbon zero or neutral by 2020. Estimates are those goals will require some 600,000 homes to be retrofitted annually. Many of those retrofit projects will include adding and upgrading insulation since, like their American counterparts, many older homes in Great Britain are likely under insulated. British Architects are beginning to take a leading role in the quest for carbon neutrality. A recent story from England on the Guardian Professional HousingnetworkBlog provides insight from Architect Nick Wilson. He proposes many practical design applications, including retrofitting insulation, that could be funded by local initiatives. The Carbon Challenge winning house design included cellulose insulation. CIMA and the APA joined forces in late 2010 to challenge architects in Florida to design houses with lower carbon footprints. The Carbon Challenge may be one of the first attempts to encourage architects in this country to begin thinking beyond zero-energy design to carbon neutral housing. Lowering the carbon footprint of homes involves thinking beyond just more efficient appliances. Specifying building materials with low embodied energy can make a big difference in the carbon required to construct new homes and retrofit older ones. Using products like cellulose insulation that divert waste from landfills and trap carbon for the life of the dwelling represent the best option for achieving carbon neutral houses. A byproduct of the Carbon Challenge was the initial development of an EcoCalculator. APA and CIMA worked with the Athena Institute to design the EcoCalculator for residential application similar to Athena’s calculator for commercial buildings. The EcoCalculator is currently in a pre-release “beta” version and in the future is intended as a tool that can be used to calculate and compare the carbon of a variety of building materials. An architect or builder can use this tool to select the most carbon efficient materials for constructing or retrofitting a home to effectively lower the overall carbon footprint. The push for carbon neutral housing in Great Britain and across the EU has been driven by government mandates related to climate change. A shift may be occurring toward the pragmatic side of reducing carbon emissions with the advent of rising energy costs and a slowing of global economies. The idea of lowering carbon footprints in housing may ultimately become the norm driven by home owner desire for lower operating costs. Architects and builders tend to respond to consumer demand quicker than governments can act on global climate change initiatives. As consumer desire for more energy-efficient houses and lower energy bills grows the housing industry will ramp up with new innovation. 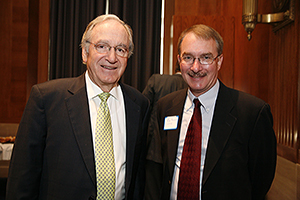 Sen Tom Harkin(D-OH) with CIMA member Jim Reynolds. Upfront costs tend to be the hurdle in getting more builders and home owners to invest in energy-efficient upgrades. Wilson also proposes a unique funding mechanism to make it possible for more home owners to pay for the government mandates in England. He proposes a tax increment financing program. In June, CIMA members spent two days in Washington, DC visiting congressional offices to share concepts about carbon neutral housing, weatherization programs and to educate legislators on the need for government to find similar ways to help our citizens invest in energy reduction programs. Estimates vary but most studies indicated a high percentage of the energy consumed in the United States is directly related to home energy uses. Investments in reducing the huge energy bill to heat and cool poorly insulated houses across the country could pay big dividends down the road and go a long way to minimizing our dependence on foreign oil. The Carbon Challenge could be a harbinger for the future of residential housing design standards in America where consumer demand has always driven innovation. The benefits of reduced energy consumption and lower costs to home owners will be the primary driver–reducing carbon in the atmosphere will be a welcome added bonus. This entry was posted in Alternative Energy, Carbon Neutral Housing, Cellulose Insulation, Energy Savings, Green Building and tagged Alternative Energy, Carbon Neutral Housing, Cellulose Insulation, climate change, energy savings, global warming, Retrofit Insulation. Bookmark the permalink.